In 2017 we often came across the question – what is the difference between HubSpot CRM and HubSpot Sales? The distinction has become a lot clearer as HubSpot has developed HubSpot Sales a lot more, but it is still not clear to some of our prospects and customers. In this blog, we will explain how the products fit together, and where the HubSpot CRM ends and the HubSpot Sales takes over. We’ll also explain the differences between the different HubSpot Sales licences from Free, Starter, Pro, and through to Enterprise. HubSpot CRM’s selling point over most of its competitors is the price. It’s free. This is a massive advantage over its competitors, from Salesforce to Pipedrive. Yes, some businesses need a fully functional enterprise-grade CRM system, but the reality is, there are many that don’t. This is where the free HubSpot CRM is positioned, and with the addition of a paid licence it can become a very sophisticated CRM and sale enablement tool that competes head on with the top CRM solutions out there. When we last looked at some competitive reviews of CRM softwares, HubSpot featured in every single one of the top lists. Check out the link to our analysis at the bottom of the page. WHAT IS THE FREE HUBSPOT CRM? So what do you get out the box with the free HubSpot CRM? HubSpot CRM gives you the ability to create contacts, company, and deal records. It allows you to create tasks and store up 1,000,000 contacts, and allocate unlimited users. This is all done in a seamless and beautiful interface that is up there with the best CRMs on the market. So this is all free? What's the catch? Of course, there is a catch. HubSpot would not have invested in this product and made it freely available if they did not believe it would lead to more business. HubSpot does want to sell you its flagship product - HubSpot Marketing - as well as some HubSpot Sales licences to enhance your HubSpot CRM, but we’re of the opinion that it’s not a foregone conclusion that you have to take the additional products to get the best out of HubSpot CRM. We know of a number of companies that are using just the HubSpot CRM to manage their company contacts. We also know of a few that use the free version of HubSpot Sales. HubSpot Sales is an additional product that sits on top of HubSpot CRM and is designed to enhance the sales process. All licence are run month to month, but your HubSpot partner can negotiate a discount if you sign for an annual period. 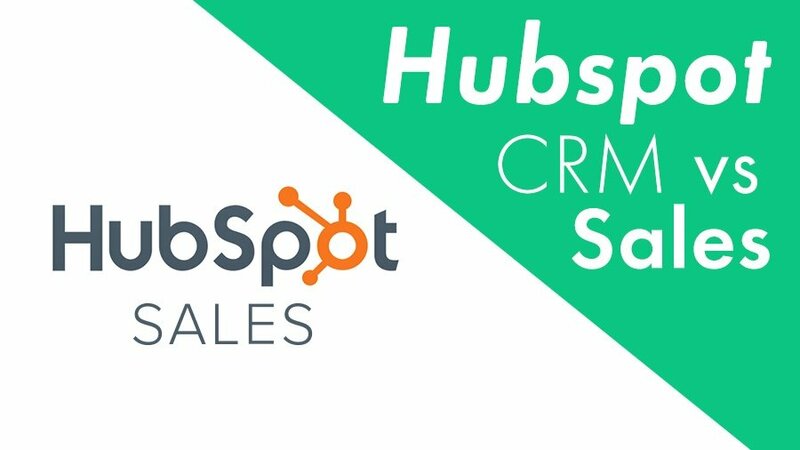 HubSpot Sales seamlessly integrates with HubSpot CRM, so that your sales team can easily log emails in the CRM, create new contacts directly from their email client, and view email opens and email click activities for any contact in the CRM. HubSpot Sales integrates perfectly with Gmail and Outlook for a seamless integration with both your email and calendar. When sending emails to clients, opens and clicks are recorded in the CRM contact record. This allows for very granular tracking and monitoring of your prospect's interactions with your company. The paid versions have a calling function, and if you make calls frequently or have international clients the flat p/month fee becomes very attractive. Best of all calls from HubSpot Sales come from your own number and can be recorded and saved in the CRM. So this is the part you really need to take notice of, because these are the three main reasons you will move from an entirely free HubSpot CRM and HubSpot Sales solution to a paid solution. The Gmail and Outlook email integration is included in the HubSpot Sales Free, so all client interactions via your email and calendar can be pushed to the HubSpot CRM. This is a hugely powerful free feature. You can even track email opens, create opportunities and deal to track sales, and you get live chat on your website with bot functionality. You need 2 or more deal pipelines with restricted visibility to CRM users. You want to use HubSpot Marketing to send out mailers, manage social media, or do any marketing automation. As soon as you plug in HubSpot Marketing - you need to pay for the contacts in your CRM according to the HubSpot Marketing licence requirements Starter: $10 p/1000 contacts Professional: $50 p/1000 contacts. You are an email integration superuser: Your users need to track many emails per month, and you want to build a portal of sales documents and resources for a sales team to use. Other HubSpot Sales paid features that work in a limited ‘teaser-like’ fashion with the HubSpot Sales Free are: Email templates (saved templates for regularly sent emails), calling (free calling), sequences (firing off a series of sales emails to a prospect/client with one click), and meetings (a booking engine linked to your calendar where a client can see available times in your calendar and book them directly). Lastly, if you do want to use HubSpot Marketing to integrate your marketing and sales processes.- you will be forced to go paid. The all-in-one inbound sales and marketing platform will allow you to manage your digital marketing efforts including website, landing pages, content, social media, SEO, call-to-actions, contacts, reporting and more in the same place that you manage your sales process. At $800 p/month for HubSpot Marketing Professional it's a significant investment over a 12 month period, but it's a very effective platform which truly integrates sales and marketing. Looking for a HubSpot South Africa partner? Read our article to find out what you need to consider. Still not convinced? Go over to whatcrm.co.za to view our guide - What CRM should you choose?